A Kansas city man was brutally beaten in front of his home in June. The attackers did not steal his keys or wallet but they broke his cheek bone and jaw. Frank Kenney suffered a blood clot that causes him to be cross-eyed today. Frank Kenney doesn’t remember a thing about the attack. A Kansas City man says he doesn’t remember a thing about the brutal attack that shattered his face and sent him to the hospital. However, Frank Kenney says the men who assaulted him will one day have to answer for their actions. 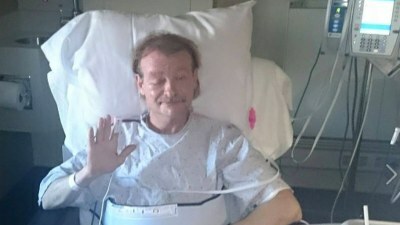 Kenney, 59, was brutally beaten outside his Midtown home near West 39th and Washington streets about 7 p.m. on June 29. He had just finished mowing and put his lawnmower inside his garage near an alley. Kenney is still suffering from the attack. He is out of the hospital but unable to return to his job as a barber in Grandview. “I’ve worked the same job for 37 years. I’ve done everything you are supposed to do the right way and here I am a victim,” Kenney said. The strangers who senselessly assaulted Kenney did not steal anything. The men left Kenney’s keys in his pocket and never entered his home. Kenney’s family worries he was the victim of the so-called “knockout game” where attackers sucker punch unsuspecting victims for the thrill.